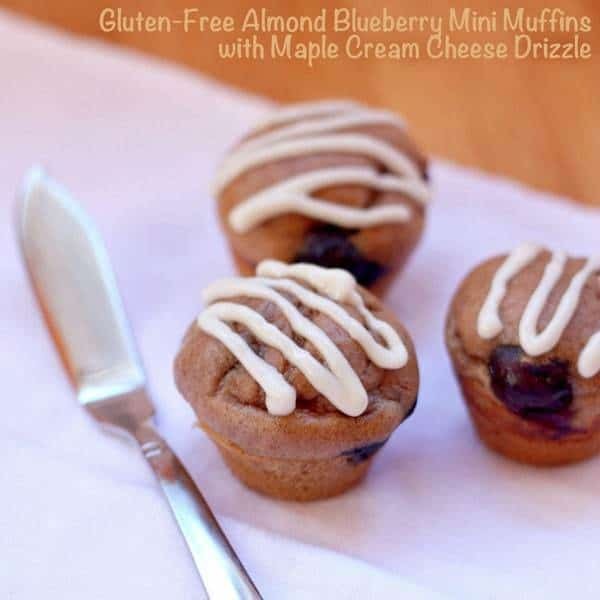 For a simple snack or bite-sized breakfast treat that’s naturally gluten-free and packed with healthy ingredients, make a batch of Flourless Almond Blueberry Mini Muffins. Since I had so much fun with the Tomato Sauce last month, I am participating in the Crazy Cooking Challenge from Moms Crazy Cooking again this month, and am excited to share this recipe with you. You see, this recipe was kind of a long time in the making. I found a recipe for Blueberry Raspberry Oatmeal Muffins, but not being one to leave well-enough alone, I thought I would switch it up a bit – strawberries for the raspberries, since the strawberries are so gorgeous right now, mashed banana for the eggs to try to make it vegan. Well, they tasted good, but they were a little bit dense, likely because of the banana. And since this month’s challenge was Blueberry Muffins, not banana bread, which these muffins more resembled, I didn’t want to use that recipe. I thought about remaking them with applesauce instead of the banana, but time got away from me. I will probably post the recipe eventually, maybe after I try a different variation, but not for this Challenge. Then I got the email fro Tina reminding us of the posting day – April 5th. For some reason, I thought it was April 15th. Aaack, no time! But the same day, I happened to stumble upon these Gluten Free Cashew Butter Mini-Muffins from The Sweet Spot. Those of you who have been reading my blog know that I have a little bit of a wheat intolerance. But I am a bit hesitant to delve into the world of gluten-free baking, with all of the flours and starches and gums that need to be combined to get the right flavor and texture. Well, this recipe required none of that. Only regular ingredients that I already had in my kitchen. These were yummy little bites. The texture was light and a bit spongy, with just a hint of almond and banana, and bursts of blueberry. They aren’t too sweet, and the maple cream cheese glaze balance it nicely. I actually would use a little more glaze that when I originally put, so I scaled up the amounts in the recipe. And I might try bananas that are a bit more ripe, and, therefore, more sweet. I actually had used up all of my ripe bananas for smoothies, so had to use the ripest ones I could find at the grocery store. But this recipe is a keeper, and I think there a lot of variations you could do. 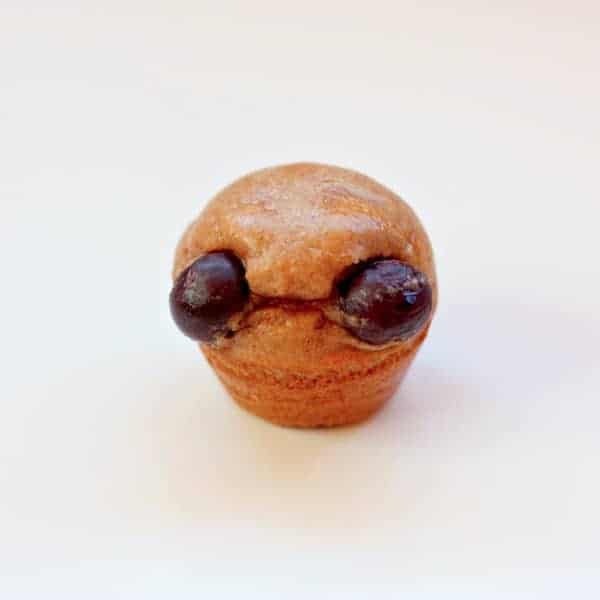 And I had to share with you my little, adorable, alien muffin. Isn’t it cute?! 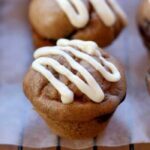 I hope you’ll give these a try, especially if you are looking for an uncomplicated gluten-free recipe, or even if you just want to try something different. Let me know what you think. What is your favorite kind of muffin? Do you tend to make recipes as written, or do you mix it up a bit? Preheat your oven to 400°F. Spray with cooking spray or grease mini muffin pan. Mix almond butter and bananas in a blender until pureed and smooth. Add the eggs, baking soda, and vinegar, and blend well. Place about 1 T of batter in each muffin cup. Top each one with about three blueberries. Divide the remaining batter between the muffin cups, about 1 T more on each. Let cool for a few minutes in the pan, then remove from the pan to cool on a rack. Drizzle with the Maple Cream Cheese Drizzle. I used a sandwich baggie with the corner cut off to put the Drizzle on the muffins. Combine 2 T softened cream cheese (regular or light) and 2 T real maple syrup and stir until smooth. 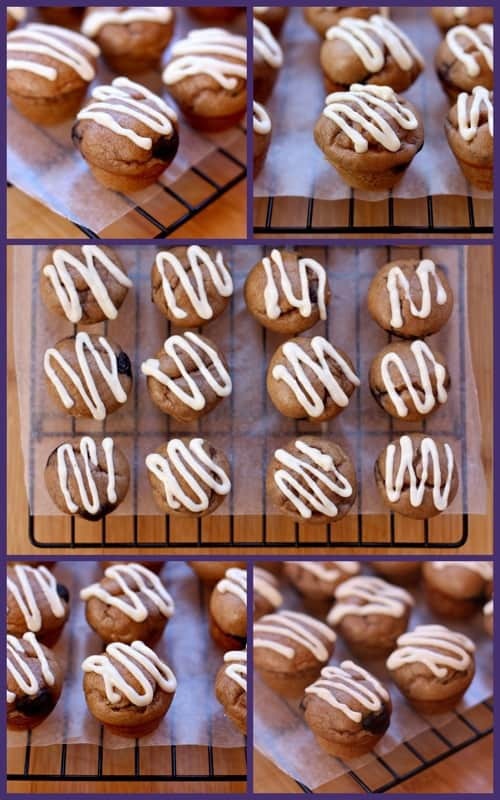 This recipe was adapted from The Sweet Spot’s Gluten Free Cashew Butter Mini-Muffins. 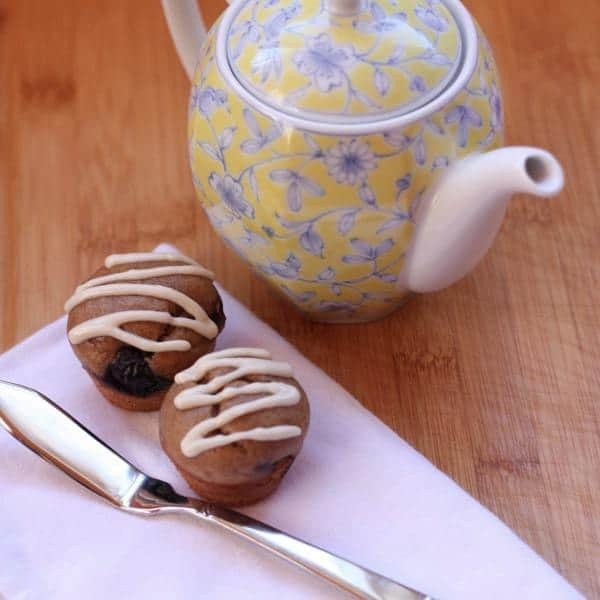 Enjoy this Flourless Almond Blueberry Mini Muffins recipe! One of my favorite nut free snacks also happens to be one of my most popular snack recipes on Cupcakes & Kale Chips… No Bake Apricot Chia Energy Bars! Oh wow, love the apple idea! Oh my goodness, thank you so much!! I am honored! 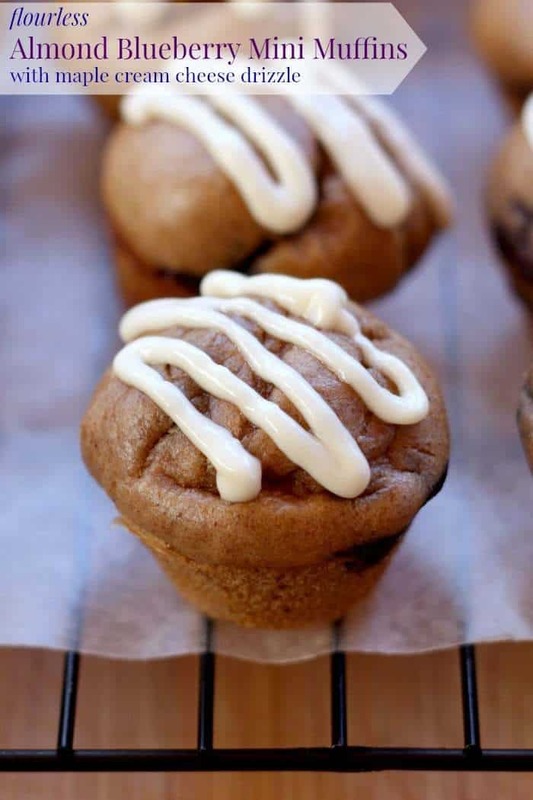 We love that cashew butter muffin too, and this is a great spin! don’t be afraid of the gf leap….once you get some ingredients, it’s not so bad, i know I would certainly help you, so don’t hesitate to ask! Thanks for sharing on Allergy free wednesdays! Thanks, I’ll have to just get up the courage to tackle it. I have a few of the flours and starches and such around, but I was stubborn and didn’t just buy a gluten-free flour blend. I haven’t takent he time to make up my own yet, but I plan to in the next few days. How many mini muffins does this recipe make? I filled one mini muffin pan, so it made 24. I will update the recipe, since it wasn’t clear. Thanks! Thanks! I love blueberries and maple together! OOOH….these look lovely. Thanks for sharing the recipe and thanks for all the links too!!! Bring on the muffins. Thank you! I know – so many great variations on blueberry muffins to check out! 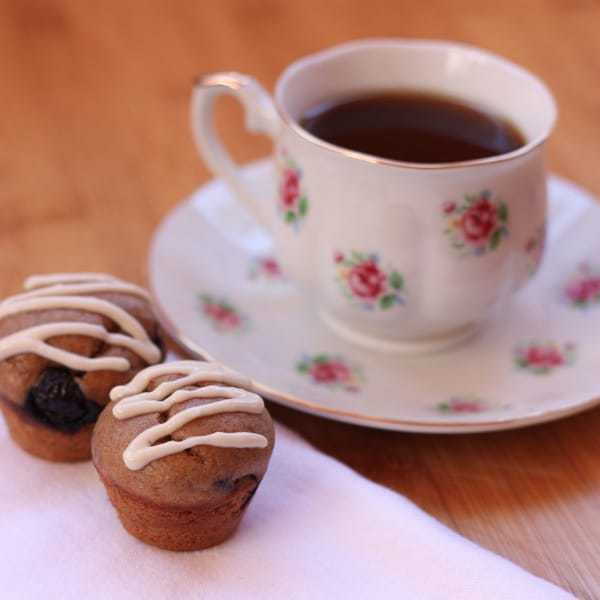 Who doesn’t love mini muffins? That maple cream cheese drizzle just sounds amazing! 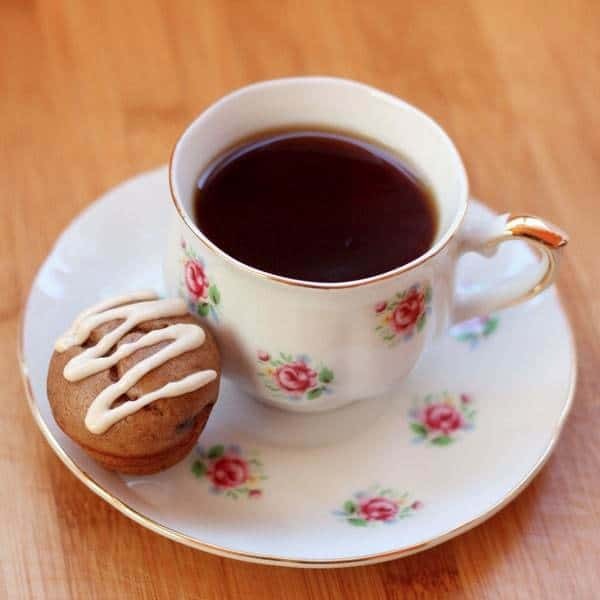 Mini-muffins are perfect to have a nice, little treat. And they are the perfect size for kids – my little guy loves them. These sound great! I’m glad I found another gf participant. Thanks! I’ll have to check out your recipe for the Challenge! These are just too cute! Just read your post about the gluten intolerance. I posted a baked GF pancake that requires no special mixes…just almond flour and a couple other basic, healthy ingredients. Thought you might want to try. These muffins look yummy…and your photos are fantastic! Hi Ann! Yes, I saw that recipe. I’ll have to try it out. I tried one with buckwheat flour. I was trying to make it like a Dutch Baby, but it didn’t turn out quite like that. Still tasty though. Thanks for the compliment on the photos. I am really working hard on photography. What perfect ingredients for a muffin… so healthy and sort of like my regular banana spread with almond butter breakfast… only so much more interesting! Now I just need some ripe bananas!! I guess this would be a fun way to mix up your usual breakfast. Let me know what you think! Haha… love the little alien :). I hope you’ll stop by and see my CCC selection. Isn’t it so cute?!?! I’ll be sure to check out your muffins. Those sound fantastic! I wonder if I can substitute anything for the bananas? Hmm, maybe applesauce, though that might make them too runny? I’ve heard of some cake and brownie recipes lately that use sweet potatoes. Maybe that would work? I love maple and blueberry together! Hi. This recipe looks great and my one question is, no flour? Yep, no flour! Weird, but it works.